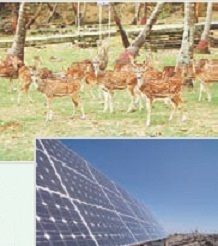 The Prince of Wales Zoological Garden is the first solar zoo park in India. All the offices, water pumps, and kitchen of the zoo park runs by utilizing solar energy. The vehicles in the park and veterinary hospital of the zoo are also going to be run by solar energy soon. Zoo’s director stated that zoo had spent more than Rs.7,84,000 for electricity. Thus now the utilization of solar power is going to help the environment by minimizing the carbon fuels. She also stated that the zoo stimulates the visitors towards the usage of solar power and thus helps for a pollution free society.